Please refer to our stock # MJ0040 when inquiring. 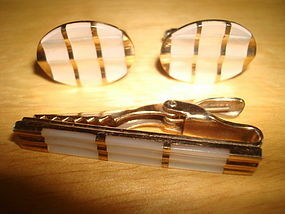 Finely crafted 1950's vintage mens formal wear accessory set. This high quality 3 piece set includes 1 3/4" wide tie clip and matching cufflinks that are each 7/8" wide and 5/8" in height. They are gold filled with genuine mother of pearl. They are of a ribbed design. They are in fine condition and are each signed AUSTRIA. A stunning set for stepping out in your best formal attire!!! A special gift for that special gentleman!! !